Let’s face it. You’ve probably given up on your eating and weight goals a few times. Or maybe more than a few times. You may be intimate friends with the art of giving up. Quitting. Walking away. And when you do that, your goals remain a distant dream that you never quite achieve. That’s why today, I’m going to coach you on quitting, and how to be prepared for those unwanted suggestions to drop what you’ve been attempting. What it looks and feels like when you think it’s time to quit and give up. Why is this happening? Again!! What if you believed that quitting was not an option? How would that make your outcome different? If quitting isn’t an option, what are your options? Is past failure evidence that you just can’t do this? What should you do when you get those familiar urges to just give up? Step by step plans to conquer the thoughts of stopping and walking away from your goals. What your own patterns around quitting are and how to rewrite your story for a different outcome. What you truly want and how to make it real. 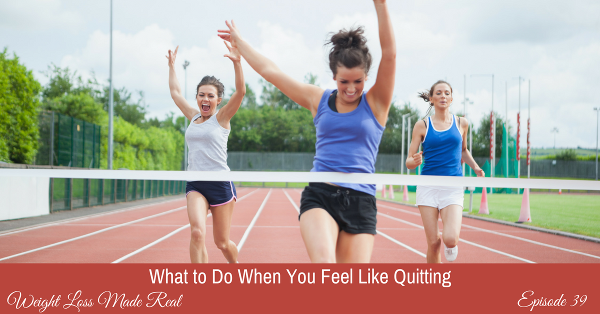 Join me in this coaching session as I guide you toward knowing how to not give in to the familiar urge to quit. This entry was posted on Tuesday, September 27th, 2016 at 4:07 am	and is filed under Podcast. You can follow any responses to this entry through the RSS 2.0 feed. Both comments and pings are currently closed.